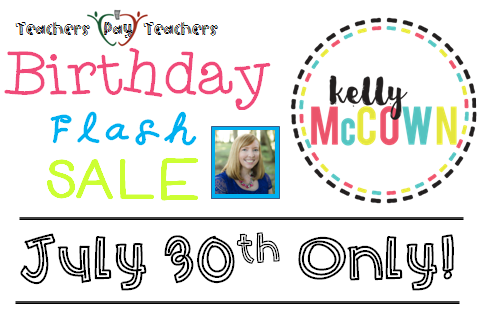 Kelly McCown: It's my BIRTHDAY Flash SALE! It's my BIRTHDAY Flash SALE! That's right! Today is my birthday, and I'm having a 20% OFF sale on EVERYTHING in my Teachers Pay Teachers Store. My birthday only happens once a year and so does this FLASH Sale. So go over and check out the deals for TODAY only!